This year’s stretch of fine fall weather – warm days, scant rain and little wind – has allowed the trees that ring the backyard and beyond to cling to their leaves. The neighbors and town wags marvel about our good fortune, which has kept the local beaches crowded on sunny days and the municipal leaf-picker-uppers on hold. I take advantage of a warm Wednesday afternoon to head home from the office early. Daylight savings is still nearly two weeks away, and I have plenty of time to tend to the yard. But the clock is ticking, and I know that soon enough my pile will be swamped with the fall harvest of leaves – all that cast-off carbon is almost too much of a good thing, though not quite, provided it’s leavened with a supply of nitrogen-rich greens. I plan to use this borrowed time to layer my nascent pile with a rich mix of starter material and to stockpile more fodder, both hot green fuel and light, airy tinder to help it ignite. I’ve brought home another bag of shredded office paper and set it beside a plastic washtub full of fresh green seaweed gathered from the seashore the day before. A harvest moon and hurricane that stayed offshore had whipped up high waves and tides, leaving behind a thick crop of seaweed. I’m saddened to see the carapaces of a clutch of baby horseshoe crabs, but am glad to have their pale green shells to add to my pile. I also have a brimming bucket of scraps from my kitchen, and my neighbor’s ash can of food waste is stuffed full as well. I’ve ladled a few shovelfuls of leftover llama beans across my pile, but still have plenty more of the pelleted poop to sprinkle into the mix. Over the past week a blaze of fall color has steadily crept up the trunks of the three maple trees along the side road of my corner yard. The crowns are now bright red, the middle branches a golden yellow, and the lower leaves brown, which slowly trickle to the ground. They fall along the street and onto my neighbor’s front yard, a hardscrabble patch they use mostly to park their cars. 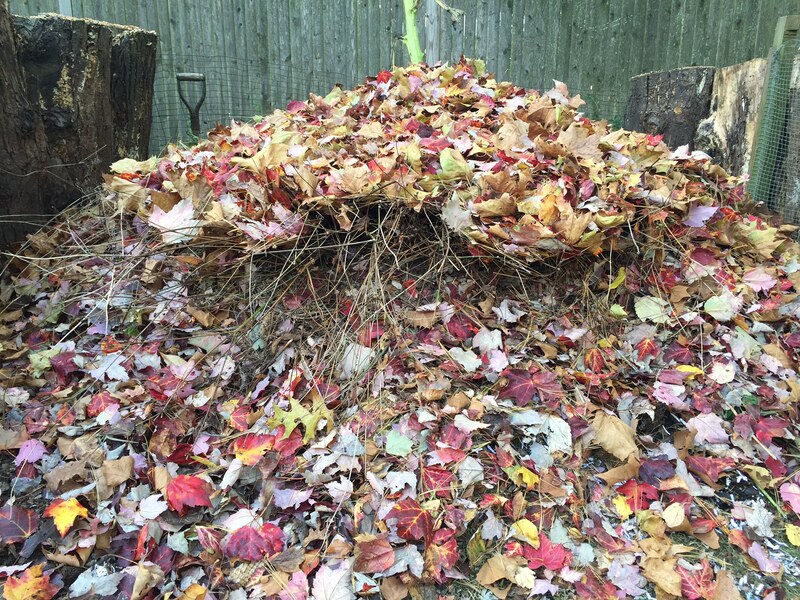 The neighbor sweeps the area clean with a rake and builds a heap of leaves for me to gather onto a bedsheet and drag over to my pile. It’s a simple task, and these early gleanings are the first to add to my pile. I haul the mower out of the shed and park it in the sun to warm the metal casing. It seems to start better this way. The lawn has grown lush and tangly in the fall growing season, and I want to cut it to add fresh green clippings to my pile, to chop up the first fallen leaves and to have the grass short for when the full measure of leaves finally do begin to fall. It’s much easier to rake and blow leaves that way. While the waiting mower warms to its task, I sprinkle the paper shreds around the thick sunflower stalk that is my pile’s tent pole, and top it with the kitchen scraps. I then parcel out the seaweed with a pitchfork, spreading it thickly across the top. A thick layer of seaweed and other green fixin’s will get my pile off to a hot start. The mower fires right up and soon I’m trundling along the yard quickly filling up the grass catcher with a fine mix of green clippings and chopped leaves, mostly from the sycamore. 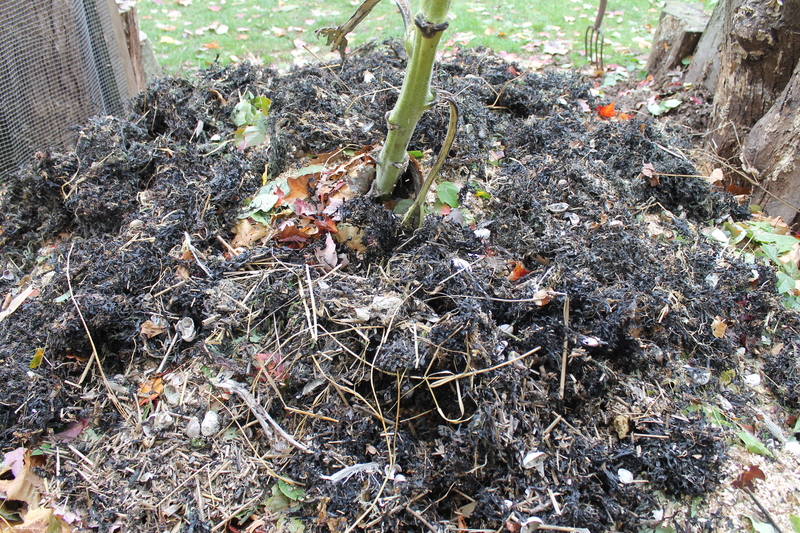 I let the catcher run full, disgorging much of the clippings back onto the lawn before stopping in front of the pile to empty successive loads to cover the stalks and stems that rise above the rotting base. I finish up the mowing as the sun lowers. The lawn is now swept clean of leaf litter, a verdant green stage upon which the leaves will soon fall en masse. I’m pleased to front-load my pile with so much “hot” green fixin’s, but worry that once buried under the crush of coming leaves it might turn anaerobic and begin to rot. So after I park the mower back inside the shed, I dead-head some of the more wispy spent flowers and add their brown, hollowed-out stalks to the top of the pile. The tangly mess will create pockets of air that allow life to breathe into the base of my pile. I have just enough daylight to grab the rake and bedsheet to sweep the side of the street along my property clean of leaves, mostly maple but also a scattering of windblown oak leaves and fallen acorns from the yard across the street, and I add two loads as a grace note to my precocious new pile. Gazing up into the twilight and seeing all the many-hued leaves still aloft, there will be much more to come, but I know I’ve given my pile a solid foundation on which to rise. My pile in mid October, a mix of fresh whole leaves, dead-headed stalks and stems and other gleanings from the yard and kitchen.